On December 1st a new ROS Mode improved. Update to v6.8.4 as soon as be possible. 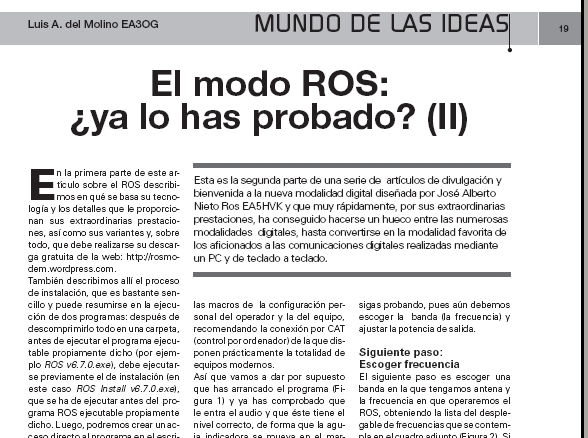 Segunda parte del artículo sobre el Modo ROS a cargo de Luis del Molino EA3OG para la revista de referencia de la radioafición en España: CQ Radio Amateur. ROS users with the Signalink USB have found problems using this interface. Signalink USB doesn’t cover the audio frequency response from 500 to 2500Hz required for ROS and others advanced broadband modes. If you have no chance of using other interface, Geoff White, G8APM, have written this great article to fix the problem.